See in Glossary is created within Unity and allows you to maintain a set of animations for a character or object. Animator Controller assets are created from the Assets menu, or from the Create menu in the Project window. In most situations, it is normal to have multiple animations and switch between them when certain game conditions occur. For example, you could switch from a walk animation to a jump whenever the spacebar is pressed. However even if you just have a single animation clip you still need to place it into an animator controller to use it on a Game Object. 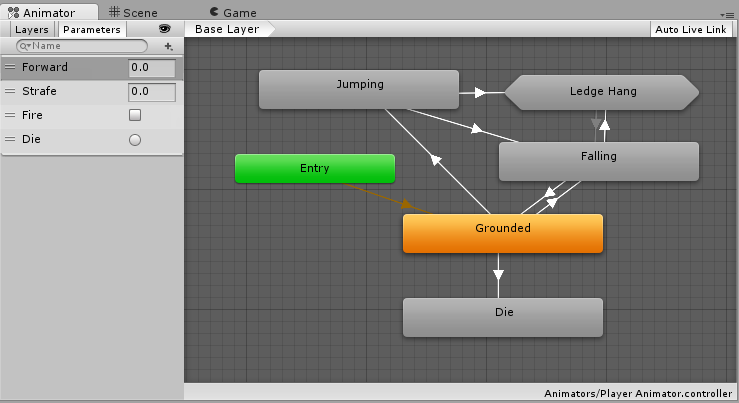 The animator controller is finally applied to an object by attaching an Animator component that references them. See the reference manual pages about the Animator component and Animator Controller for further details about their use.